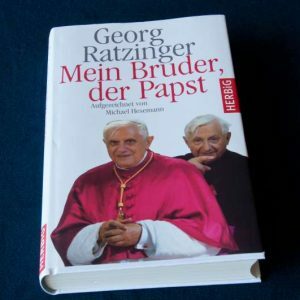 Georg Ratzinger was born January 15, 1924. He is the brother of Pope Benedict XVI. 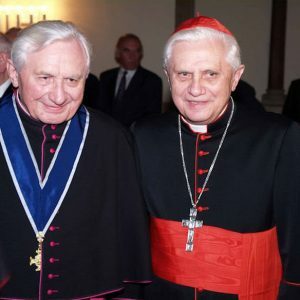 They were ordained together, and he, like the Pope, is a musician who is known for his work as a conductor of the cathedral choir of Regensburg, Germany. 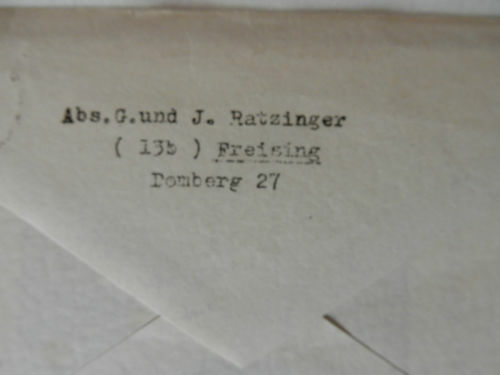 Ratzinger was born in Bavaria to Joseph Ratiznger, a police officer, and Maria Ratzinger. 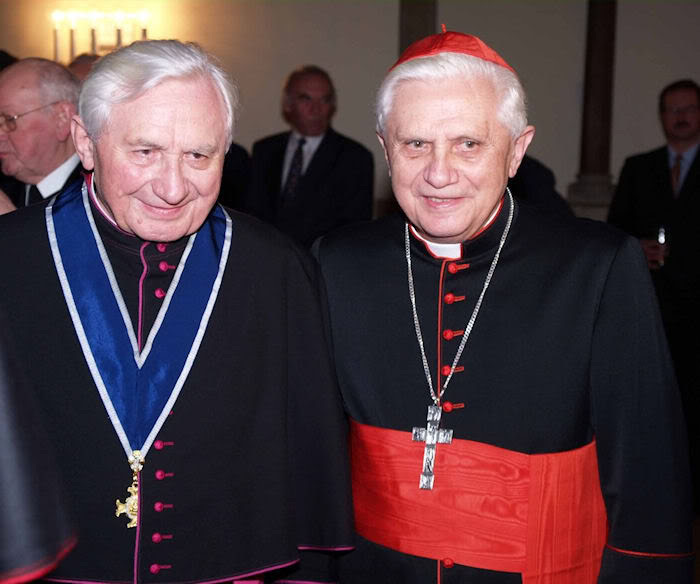 His younger brother, Joseph, of course, later reigned as Pope Benedict XVI, from 2005 to 2013. He has a sister, Maria. 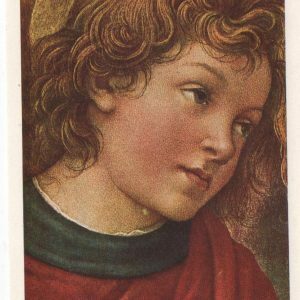 Early in his life he showed musical talent, playing the church organ at 11. In 1935 he entered seminary and continued to have professional musical instruction. Eventually he directed the cathedral choir and they performed in Salzburg on the occasion of the 150th anniversary of Mozart’s death. 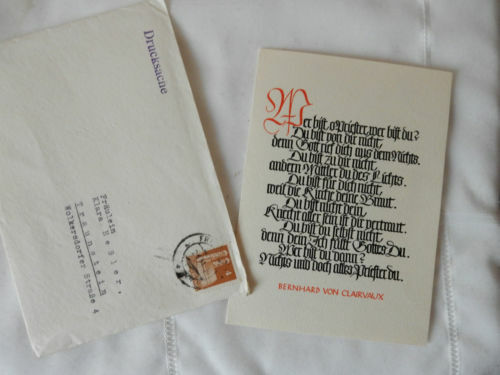 This item is actually a holy card that Georg Ratzinger, brother to Pope Benedict XVI, had printed for his ordination. 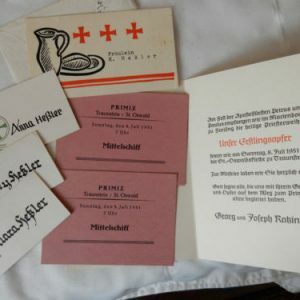 Nearly all priests have their own cards printed to commemorate ordination, the most important event of a priest’s life. 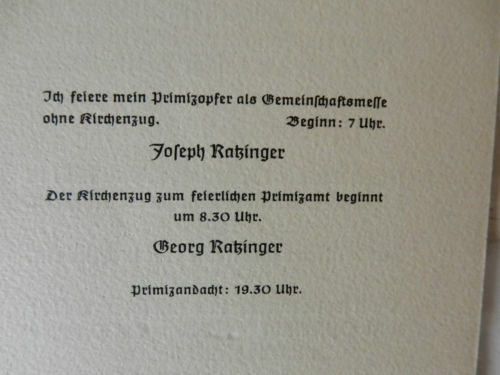 And this one was printed for Father Georg Ratzinger and is nearly identical to the one his brother had printed. 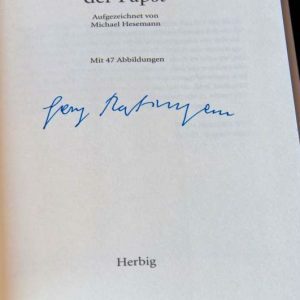 It’s a great item to have because it dates back to the very beginning of the ministry of the man who was our Holy Father from 2005 until his resignation in 2012. 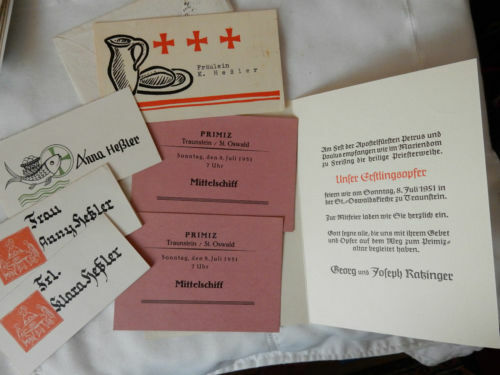 And what is of greatest interest is the fact that both brothers signed these holy cards at the time of their ordinations. They are very nice additions to this Collection. 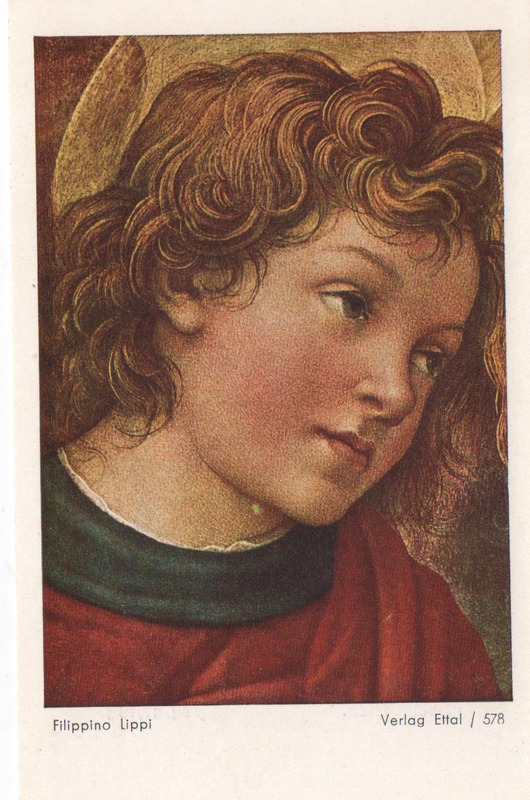 Lots of times, on one side, there will be a holy picture, as is Joseph Ratzinger’s, which is an image of the Madonna and Child. Sometimes, priests choose a saint, or an image of Christ or a saint for whom the priest has a particular affection. Oftentimes a favorite scripture quote is used, and the date and location of ordination is also included. 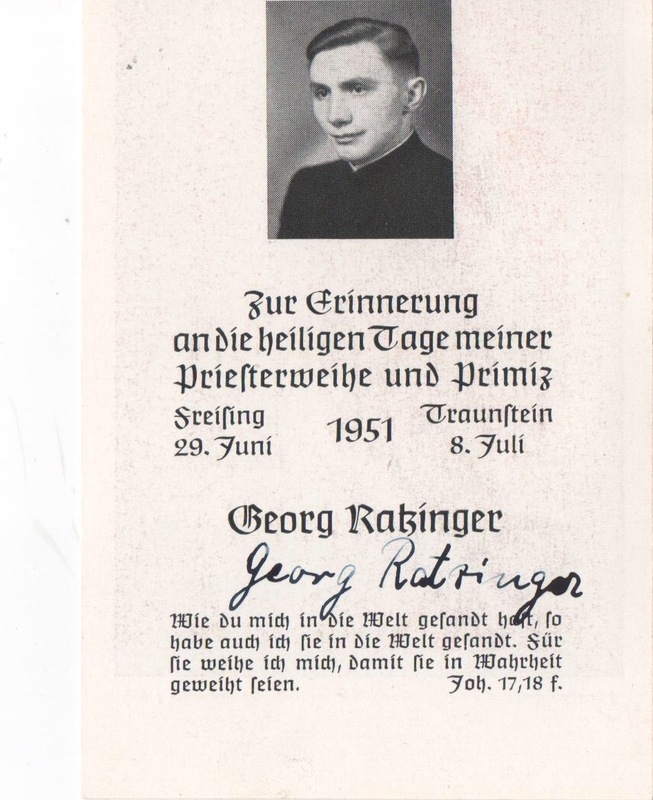 Father Georg Ratzinger was ordained on June 29, 1951. Consecrate them in the truth. As you sent me into the world, so I sent them into the world. 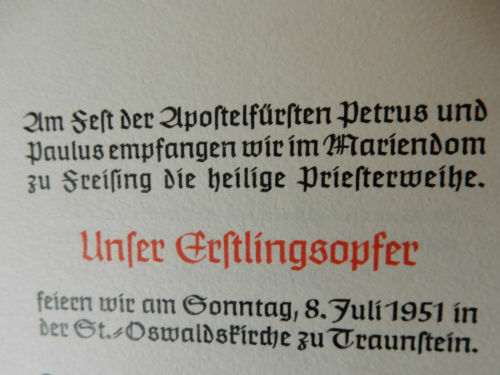 We are grateful to Elfriede Klar of Esch, Germany, for her assistance in the translation of this ordination card. 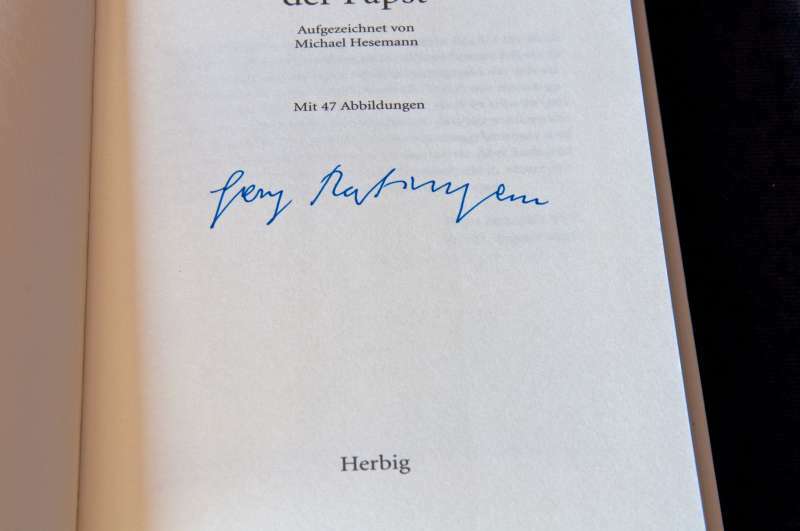 The item is a signed copy of Georg Ratzinger’s biography of Pope Benedict XVI: My Brother, the Pope. 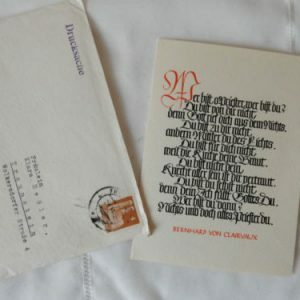 The war and Nazism interfered with this period of his life. He was drafted into a branch of the German army but was wounded in 1944 in a battle in Italy. At the end of WW II he was a POW of the U. S. When released, he arrived home in July of 1945. 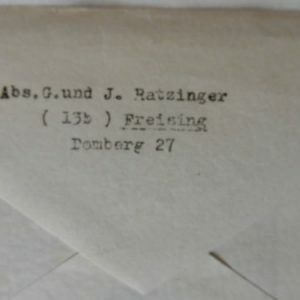 In January of 1946, he and his brother Joseph entered the seminary for the archdiocese of Munich and Freising to study for the priesthood. He continued his musical studies. The two brothers were ordained in 1951. 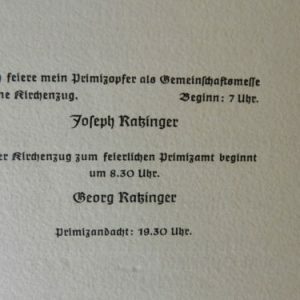 Afterwards, Georg studied church music in Munich while serving in different priestly functions for the diocese. Those studies were completed in 1957, and he became the choir director in his home parish in Traunstein. 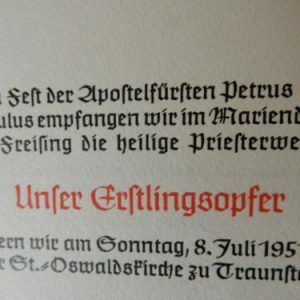 Many musical awards were to follow this appointment, including conducting for his brother’s consecration as Archbishop of Munich and Freising. His choir sang in honor of Queen Elizabeth II at her state visit in 1978, and at Pope John Paul II’s visit to Munich in 1980. He is, to say the least, an accomplished musician and director. 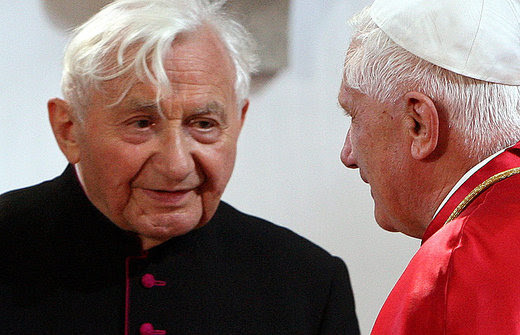 He celebrated his 90th birthday on January 15, 2014 with Pope Benedict XVI in the Vatican. 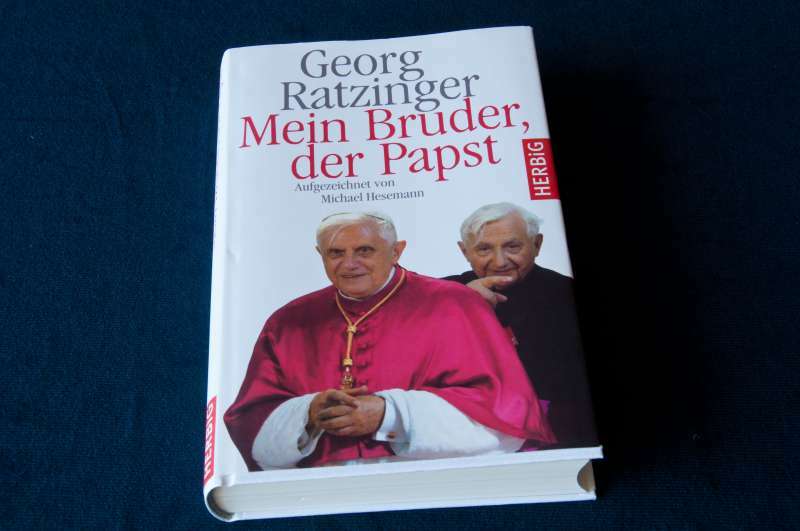 Papal Artifacts is honored to include Georg Ratzinger in our Notable Individuals’ segment.